Morrone tradition. On the first Sunday in May the statue of the Virgin Mary is carried in a procession to the parish church of Morrone, and the second in October when it is carried back to the chapel in Casalpiano, in a symbolic seasonal migration parallel to the migration of shepherds to Apulia. Food of Morrone. A very typical dish in Morrone are cookies called “pecellate”, which are made with semolina flour, walnuts, wine, and orange peel. The patron saint of Morrone is San Modesto. A sight worth seeing. 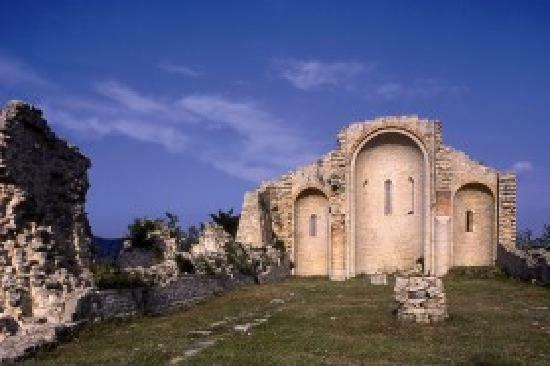 The ruins of the Badia of Casalpiano, which were built in the 12th century & destroyed by the terrible earthquake in 1456, are second only to the natural, breathtaking views of Morrone. Benvenuti and welcome, fellow gelatovores, to Iorio's very own blog! It's been more than a decade since Nick and Mary Lemmer, Iorio's co-owners and siblings, began selling authentic Italian ice out of a cart at events and fairs across Michigan. The Iorio's Gelato of today is not only the product of the countless experiences, challenges, and triumphs of the past ten years. It is also a reflection of hundreds of years of Italian culture and Iorio family history. As we continue to strive for delivering the highest quality gelato and espresso in our very own little piece of Italy, we are committed to incorporating our rich history with an innovative future. And we want to share all of it with you, our loyal gelato friends and family! Stop by our blog to learn more about our people, our products, and our history. We'll be posting stories about the Iorio's family and our wonderful staff, highlighting new and classic products, and sharing the latest and greatest in gelato making and coffee brewing techniques. We want this blog to be a place not only for you to learn about us, but for us to learn about you, too! If you have a question you'd like us to answer, a topic you'd like to know more about, or a flavor suggestion, let us know! Keep an eye out for our second post. The question on everyone's mind: How is gelato different than ice cream?